When we were building our house, Neal and I designed the master bathroom to be the calming escape that I’d retreat to at the end of the day. Many of you always ask about where things come from, so here is the guide to creating a peaceful master bathroom like mine. I like knowing where I can find things when I see blogs, and I hope you do too. I paired soft colors with white to give a refreshing and lightweight feel to the room. Not only do the Marvin windows framing the bathtub provide a beautiful backdrop, but they also let natural light in, complementing the light colors. I designed the side windows to open, so I can enjoy the peaceful breeze and really take a breath of fresh air. In choosing my overall design, I started with the cabinet style and color. I love Diamond cabinets because they are customizable. You can select the door and the finish, so I chose the Rothshire design. It’s simple, and I think it’s so beautiful in Dover, a very soft gray-white. Neal and I both have built-in clothes hampers as well. The galley bathroom style is perfect for us—he has his area and I have mine. Once the cabinet style was decided, I began thinking about functionality. I wanted everything to pull out. When I began to explore the options, I was thrilled to find many choices that made me smile because my days of crawling up in cabinets are over. The trash can slides right out, and the storage under the sink has pull-out shelves. The towers with leaded seeded glass on either side of the room add an Old-World look that I just love. The makeup drawers have sliding compartments where my makeup is stashed—and for me, that’s a big stash! In keeping with my cool color palette, I chose “Palace Pearl CW-650” from Benjamin Moore’s Williamsburg Paint Color Collection for the walls. The soft, powdery blue is beautiful and sets the mood for relaxation. It’s the ideal backdrop for the cabinets and my cherished painting of Williamsburg. Amerock’s Carolyne hardware in a bright polished finish was exactly what I needed for this room. I decided on the square-shaped knobs to add a modern touch to the cabinets. 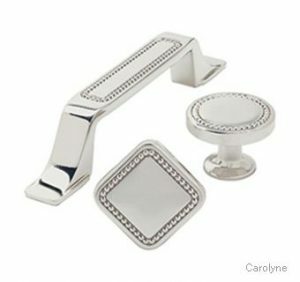 The beading on the pulls and knobs is a one-of-a-kind design element that finishes the cabinets to perfection. Kohler was my go-to company for bathroom fixtures. I adore the focal point of the alcove—a white, oval soaking tub with chrome faucets from the Artifacts collection. This antique faucet style is one of my favorites. I chose sinks from the Kathryn collection because of their unique shape. After I got all my fixtures and lighting installed, it was time for bathroom mirrors. Griffith Art Gallery in Pelham has extraordinary selections of frame molding as they are predominantly an art gallery. They can also make mirrors with beveled edges in any size. I chose an Italian finish of silver with a tinge of gold. I must have a fan in my bathroom, so I selected a fan from Hunter! Its modern style is perfect, blending beautifully with the other finishes in the room. When that hair dryer is going strong, I flip the switch and a wonderful cool breeze fills the room. Honestly, I really do leave it on most of the time. The Daltile floors are porcelain, but they have a marble design. I love porcelain for its easy-care characteristics, and the marble-colored striation fits perfectly with the colors I chose for this room. You should think about creating a space of tranquility for yourself. If you are considering remodeling or redecorating, design a space that takes you away from the noise of everyday life. Sometimes just a new coat of paint and a change of cabinet knobs is all you need. Make the room your own and surround yourself with things you love. 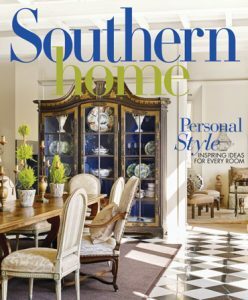 In the holiday issue of Southern Home magazine, you will find a complete story of the house. Be on the lookout for it and in the meantime, enjoy the September/October issue. You’ve created a beautiful bathroom. I am puzzled about one thing; where do you hang your towels that would normally be next to the vanity sinks? Catching up on my reading… this is gorgeous – what a terrific job you’ve done in décor. Beautiful, beautiful blue. Enjoy your new home. Look forward to seeing more soon. Oh, I love it!! Gorgeous! So lovely and serene, and smart design! Perfection. Having read your magazines for years, I’d expect nothing less in your home. Thanks for sharing. This room is peaceful, calming, and spectacular! What a gorgeous retreat to escape to at the end of a day. Ah…time to soak. So very pretty Phyllis! I love everything ! I know you are enjoying your new home…. cant wait to see to the rest of the house in a couple of months!! 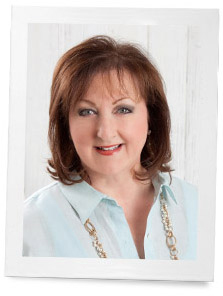 Phyllis, the space is beautiful and very peaceful with your BM paint selection! Thank you Phyllis for sharing this! It’s absolutely stunning!!! I love everything and you’ve blended it all so perfectly … even right down to the mass of tulips in the beautiful antique looking silver container. The painting opposite the tub reminds me of the old Calgon bath beads commercials…”Calgon, take me away!” I’m wondering if the painting has a special meaning of perhaps one of your special visits to the English countryside? Soak, reflect and unwind! The paint does not have a special meaning, but I adore their Williamsburg Collection. This color blue was just perfect for me. Beautiful! Just beautiful! You have great taste! Thank you for sharing your most serene space with us. It truly is beautiful and full of inspitation! Love the paint color. I will definitely be watching for the magazine feature – can’t wait. I love that you made this your own – and not so trendy – but classic. Beautiful but where is the Shower? If you are looking at the tub, the shower is a walk-in and the door is to the right before you get to the tub. 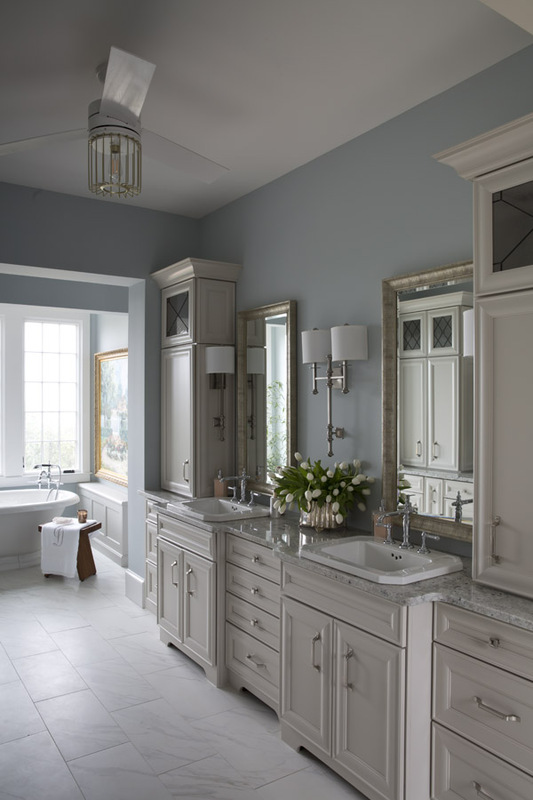 Where did you purchase the sconces flanking the sink mirrors? Thank you so much for sharing your wonderful Master Bathroom! Enjoy! Where is the shower??? If you have one I would love to see a picture of it. is there a shower in your bathroom? Beautiful! Love the design & the colors! Beautiful I could escape here!!! !